A South Carolina preservation group has found a likely buyer for a small-town historic hotel, and, just as the nonprofit had hoped, its potential owner wants to restore the 100-year-old building to its former use. When Eric Richey first saw the Plantation House Hotel in Edgefield's town square, he felt drawn to the property, he said, despite the fact that, until now, he's never pursued a development project of that kind. "There was just something about the town and the building," Richey said. "I'm excited." Through his company NAF Holdings, the Greenville resident signed a contract with the nonprofit group Preservation South Carolina earlier this month and is in the process of further researching the project's feasibility. 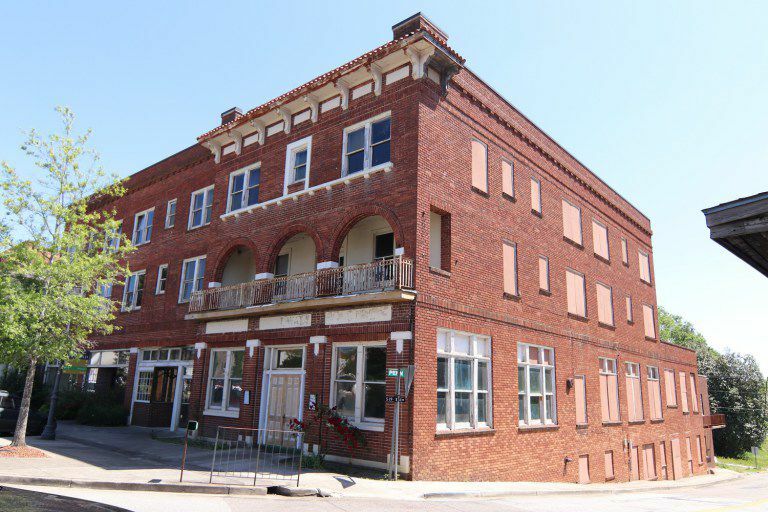 Preservation South Carolina, which focuses on saving historic structures across the state, put the Edgefield hotel on the market last November, hoping to find an investor or group of investors who would restore it. In its listing, the group predicted the building could accommodate about 33 guest rooms, in addition to retail space and either an event venue or restaurant on the first floor. The organization also noted that the building is eligible for the National Register of Historic Places. When the structure first opened as the Dixie Highway Hotel in 1919, it was described in the local press as the "joy and pride" of the community and "the most modern and the best-appointed hotel in the state outside of the cities." Despite early praise for the business, the hotel ran into financial trouble not long after, largely due to the boll weevil, a beetle which wreaked havoc for Southern farmers in the 1920s. After changing hands several times and, in the 1960s and '70s, functioning as a home for veterans, the building eventually closed and sat vacant for years. Richey said he can imagine the hotel becoming a weekend getaway for residents of the Aiken-Augusta metro area, which is about 30 miles away from Edgefield. Richey was also impressed, he said, by the number of visitors Edgefield already draws, especially to its Winchester Museum. Operated by the National Wild Turkey Federation, which is headquartered in town, the attraction says it draws about 5,000 visitors annually — that's around the same figure as the town's total population — and boasts oddities like the world's largest turkey call. And as travelers continue to seek out authenticity and novelty in their accommodations, Richey said he's optimistic Edgefield has that appeal. By restoring a historic structure that was originally constructed as a hotel, he said, he hopes the project would build on the town's character rather than change it. "I want Edgefield to keep its sense of place," he said. Readers of Southern Living magazine have named Charleston the "South's Best City" for the third year in a row. New for 2019, though, Charleston also snagged the top spot as the South's best food city. Last year, it came in second behind New Orleans for that honor. Appropriately, several local restaurants and chefs were named on the magazine's cuisine-related rankings. The chefs at FIG and The Grocery earned mentions, and chef Sean Brock's Queen Street restaurant Husk ranked on both the magazine's lists of South Carolina restaurants and the best dining overall in the South. Rodney Scott's BBQ on Upper King Street was voted the best barbecue in the state, though it didn't make their overall top 10 of Southern barbecue joints. The Sanctuary on Kiawah Island, Wild Dunes Resort on the Isle of Palms and Belmond Charleston Place and the John Rutledge House Inn in downtown Charleston all scored spots on top lodging lists. Two Beauforts battled it out for the "South's Best Small Town" distinction. Readers voted North Carolina's Beaufort no. 1 while the Palmetto State's city of the same name — though with a different pronunciation — was the runner-up. Aiken, which topped last year's small town list, came in fourth. About 65,000 respondents weighed in on this year's picks, which were released on the publication's website last week. The rankings will appear in the April print issue.